M-F we're busy from about 5 to 7. Often, there's not much time for the gym. 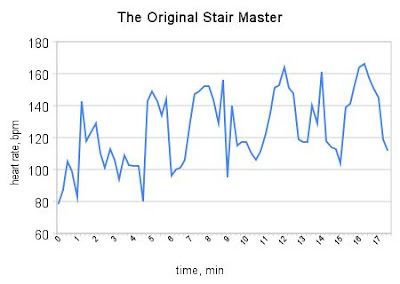 The heart rate profile depicted here is how I spent a portion of a recent lunch period. I took the stairs over a period of about 20 minutes to get to the cafeteria. Aside from a few odd looks on the stairwell, it was a pretty good cardio routine - and free. Down stairs slow and back up even slower. No matter how slowly I went, my heart rate got pretty high.